Yellow flat noodles similar to fettucini tossed with fried pork lard oil, black vinegar, chilli and topped with spring onions. The noodles when done well are springy and has a good chew to it. The bowl of soup comes in a metal bowl which is kept warm by a small heat source at the base. 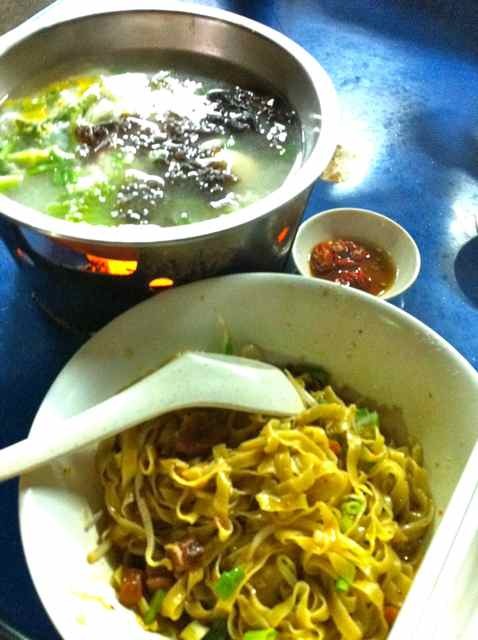 The soup is pork base with minced meat noodles, pork balls, fish cakes, vegetables, seaweed and an egg cracked in. If you want to spice it up some more, eat it with the chilli padi and soy sauce. Another one of my comfort foods that I can't get in Vancouver. Available at most food centres and the standard is generally pretty good.